Moon revealed to have an Earth-like core | Watts Up With That? WASHINGTON – State-of-the-art seismological techniques applied to Apollo-era data suggest our moon has a core similar to Earth’s. Uncovering details about the lunar core is critical for developing accurate models of the moon’s formation. The data sheds light on the evolution of a lunar dynamo — a natural process by which our moon may have generated and maintained its own strong magnetic field. The team’s findings suggest the moon possesses a solid, iron-rich inner core with a radius of nearly 150 miles and a fluid, primarily liquid-iron outer core with a radius of roughly 205 miles. Where it differs from Earth is a partially molten boundary layer around the core estimated to have a radius of nearly 300 miles. The research indicates the core contains a small percentage of light elements such as sulfur, echoing new seismology research on Earth that suggests the presence of light elements — such as sulfur and oxygen — in a layer around our own core. “We applied tried and true methodologies from terrestrial seismology to this legacy data set to present the first-ever direct detection of the moon’s core,” said Renee Weber, lead researcher and space scientist at NASA’s Marshall Space Flight Center in Huntsville, Ala. The team also analyzed Apollo lunar seismograms using array processing, techniques that identify and distinguish signal sources of moonquakes and other seismic activity. The researchers identified how and where seismic waves passed through or were reflected by elements of the moon’s interior, signifying the composition and state of layer interfaces at varying depths. Although sophisticated satellite imaging missions to the moon made significant contributions to the study of its history and topography, the deep interior of Earth’s sole natural satellite remained a subject of speculation and conjecture since the Apollo era. 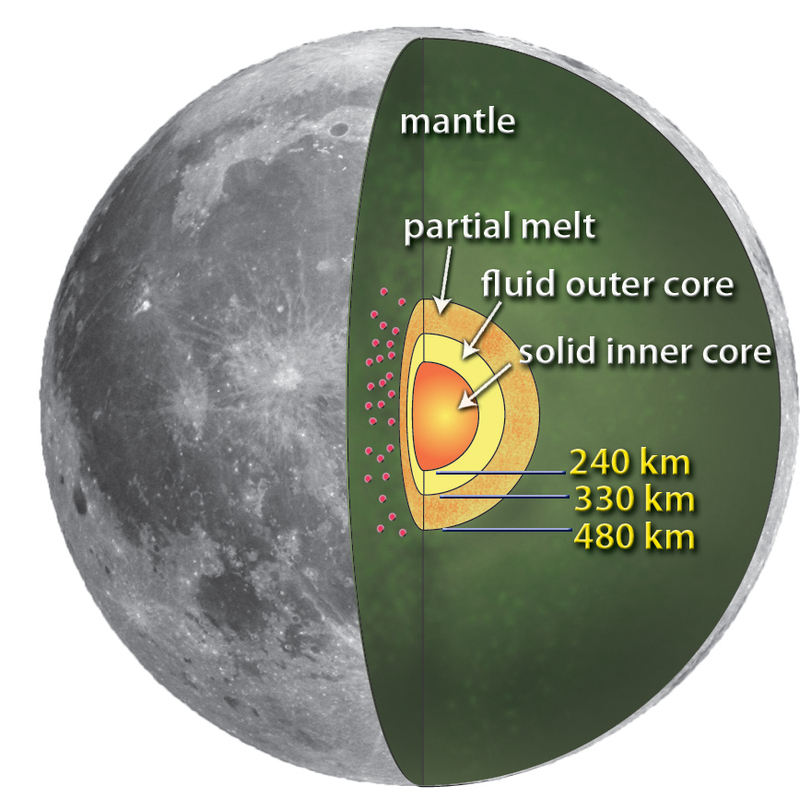 Researchers previously had inferred the existence of a core, based on indirect estimates of the moon’s interior properties, but many disagreed about its radius, state and composition. A primary limitation to past lunar seismic studies was the wash of “noise” caused by overlapping signals bouncing repeatedly off structures in the moon’s fractionated crust. To mitigate this challenge, Weber and the team employed an approach called seismogram stacking, or the digital partitioning of signals. Stacking improved the signal-to-noise ratio and enabled the researchers to more clearly track the path and behavior of each unique signal as it passed through the lunar interior. “We hope to continue working with the Apollo seismic data to further refine our estimates of core properties and characterize lunar signals as clearly as possible to aid in the interpretation of data returned from future missions,” Weber said. Future NASA missions will help gather more detailed data. The Gravity Recovery and Interior Laboratory, or GRAIL, is a NASA Discovery-class mission set to launch this year. The mission consists of twin spacecraft that will enter tandem orbits around the moon for several months to measure the gravity field in unprecedented detail. The mission also will answer longstanding questions about Earth’s moon and provide scientists a better understanding of the satellite from crust to core, revealing subsurface structures and, indirectly, its thermal history. NASA and other space agencies have been studying concepts to establish an International Lunar Network — a robotic set of geophysical monitoring stations on the moon — as part of efforts to coordinate international missions during the coming decade. I suspected this would be the case because the moon is essentially a rocky planet like the Earth. Kudos to the scientists and engineers for demonstrating it. Well naturally, because as we all learned from “The Adventures of Rocky and Bullwinkle” there are moonmen who live on the moon and logic tells us they could only survive on an earth like place. This also points to the importance of maintaining the manned space program. I hope this isn’t just another NASA ‘modeling’ exercise because they need to be doing some real science to regain their standing. As much of a “space junkie” that I am, and as much as I thrive on this sort of article, I can’t help but feel pangs of suspicion when I read stuff like this. The whole upshot of the great global warming hoax is a general mistrust of not so much the science, but the scientists presenting it. Nevertheless, a very interesting article, and an entertaining read. Thanks. This work still involves simulations. If you take the data and compare to known phenomena experiments, this is what you come up with. Another piece of evidence pointing towards the theory that all heavenly bodies are hollow is that, as you would expect with a hollow sphere, both the Earth and our moon are known to “ring like a bell” when hit with a shock wave. “It is not commonly known that the Earth displays the same bell-like ringing or reverberations as the moon. Since the Earth is 81.56 times more massive than the moon, it takes a much larger explosion or shock wave to generate this effect. “Joseph Goodavage referenced such occurrences in his book, “Astrology: The Space Age Science”. He mentioned that the ringing effect was recorded during the May 22, 1960 Chilean earthquake. This was supposedly the most violent earthquake that had been recorded since the establishment of official world records in 1881. Goodavage provided a description of the effect which was given at the 1961 World Earthquake Conference, held at Helsinki, Finland. Proof that the “ringing” of the moon is common knowledge in the scientific and NASA communities is presented in communications between Mission Control and the men aboard the Apollo 17 moon mission on December 29, 1972. “LUNAR MODULE PILOT (LMP): Was there any indication on the seismometers on the impact about the time I saw a light flash on the surface? CAPCOM: Stand by. We’ll check on that. Research/Writer Don Wilson presents other well-documented evidence supporting the Hollow Moon Theory. While some “orthodox” scientists will quietly admit that some earthly bodies are probably hollow, they steadfastly refuse to accept the fact that ALL planets and moons are NATURALLY hollow and hurry to add they must be “artificial” satellites. “The moon seems to be a comparatively light world in contrast with the planet Earth. The fact that the moon is only about 60% as dense as our planet has led scientists to two theories: that the moon is without an iron core, and/or, that it is partially hollow. “Data and computations – among them, Dr. McDonald’s motion studies, – point to the conclusion that our moon is internally hollow to a great extent. Once again, the “establishment” scientists are trying to “fit” the facts to their “sacred cow” theory. In no way will they “buck” the system and admit the obvious. The facts, once again, support the theory laid out by Gardner and Reed all heavenly bodies are hollow. (1) “Moongate: Suppressed findings of the US Space Program”. William L. Brian II. Portland, OR: Future Research Publishing Co. 1982. (page 126). (2) Ibid. (page 126-127). (3) “Our Mysterious Spaceship Moon. Donald K. Wilson. New York, NY: Dell Publishing Co. 1975. (page 60). We read about all of these great scientists in people, and we think to ourselves, “Wow, these such scientists were such amazing people! And brave too, standing up to the powers that be. But … most of their fellow scientists in their day were among the powers that be. I don’t think it’s that much different now than then. Looks like some real scientists archived their data using the technology of the day to allow a future generation to benefit from advances in other fields applied to the original field of data collection . Where it differs from Earth is a partially molten boundary layer around the core estimated to have a radius of nearly 300 miles. The research indicates the core contains a small percentage of light elements such as sulfur, echoing new seismology research on Earth that suggests the presence of light elements — such as sulfur and oxygen — in a layer around our own core. What exactly is supposed to be the difference? The dimensions? The small percentage of light elements such as sulfur and oxygen, which it then states are being also discovered in layers around the earth’s core? Am I missing something here? What exactly is supposed to be the difference? As a WAG, I’d say the relatively thick partially molten boundary layer. This appears to be substantially different to the earth’s D” layer. I recall that Piers C. claims that his long range weather forecasts take account of modulation of the sun’s magnetic flux with, I think I recall, a 60 year lunar cycle. 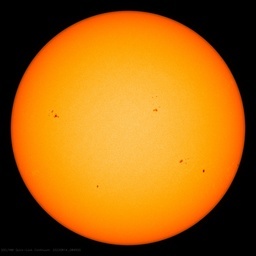 I also recall that there is a sixty odd year cycle in global temperature. Perhaps somebody should tell the UK Met Office. Better by far to let them sleep on quietly, into the cold. Brant – does a solid sphere ring slowly when suspended in the air and struck with a hammer? That should be quite easy to verify or refute if you are interested in a hollow satelite theory. Also have you any theory how a hollow satelite could form in the first place and not collapse because of gravity as it coalesced? working seismic equipment up there….Maybe they are right. Several years ago, I had a brief conversation with Gene Kranz. He advocated more space exploration. Great! I’m all for that. He thought robotic missions were sufficient. I said that if we humans go to live somewhere, we’ll do lots of exploring anyway. It’s sad that it will likely be more than 50 years before we get back on the Moon again (Dec 14, 1972-2022). I’ve been very disappointed with our progress in space. Apollo returned far more to our economy than it cost. We’ve burned up so much in entitlement programs that we could have used to grow our technology, and keep people working. We might have had a permanent moonbase already. We don’t need plant-the-flag missions. We need to be on the Moon and elsewhere, engaged in valuable activities making space pay for itself. That’s what made Columbus successful, staying in the New World when others before him visited and left. At this point, few things fit the bill: Maybe 3He (fusion), but certainly information. We can investigate various things on the Moon we can’t study on Earth. And as we know, the Moon is a second place to live, an insurance policy for our survival. People living on the Moon eventually would have reason enough to make staying there successful. Once the number of people living in a colony reaches a certain point, without really cheap energy, return trips could become too expensive for everyone to go back home. Living on the Moon would become permanent by default. That would make building, growing, and learning to be self-sufficient essential in a Lunar colony. I suspect there would be plenty of people willing to travel one way once colonies are large enough. Initially, primary goals would be to set up the facilities on the Moon and learn to survive in a harsh radiation environment. Almost certainly, we will have to live mostly underground. Until we learn more, a manned Mars mission is a suicide mission (you should see what cells look like after being irradiated). We also need to learn how to manage limited ecosystems. I find it hard to believe mechanical devices would be the best choice to re-supply air, water, and food to a large colony. Bioprocesses are much more efficient. What we learn can be applied to understanding Earth. I just watched 2001 again, this time in Blue-ray. Wow! (I could just about read the instructions on how to use a zero gravity toilet.) Think about how much more we could have accomplished (like in the movie) if we had not gone off track. We did do a good job developing computing devices as shown in the movie. I realized, in 1968, Kubrick showed the equivalent of Apple iPads. Glad we don’t have HAL9000 yet. Three cheers for all the private companies getting into the space biz!!! Many of us who could not move from the TV as Neil and Buzz walked around on the Moon want to see us do that again. It’s a small world. Earlier this evening and for no good reason, I read a half-dozen pages or so on lunar seismicity, from a 1975 book entitled, ‘Lunar Science: A Post-Apollo View’, by Stuart Taylor, then of the Lunar Science Institute, Houston. It outlines the results and interpretations developed from the various investigations and is a cracking read (this copy ex-lib cost 45 pence :-). It’s kinda neat to be able now to directly compare that text with today’s finer-tuned understandings. Broadly, it was believed in ’75 that the data did not rule out the possibility of a core. Indeed, the data permitted the existence of an iron core of radius 450 km (~280 miles) but for which there was no seismic evidence available, or an Fe-FeS (iron-iron-sulphide) core of radius 700 km (~435 miles), as revealed by S (shear) wave discontinuity. So, vindication there, some forty years later and a timely reminder of the value intrinsic in both good data and scientific method. Incidentally, it turns out that the evidence for the partially-molten interior was helped no end when in July, 1972, an estimated one-ton meteorite impacted on the far side. The absence of S waves (which are not transmitted thro’ liquids) indicated a central zone some 600-800 km radius at about 1000 km depth. This might have caused a stir on the seismographs given that they were set at maximum sensitivity, capable of detecting displacements to one angstrom (10^-8 cm). A bit O/T but as an idea of just how relatively seismically inactive the moon appears to be, it is estimated that of the less than 3,000 or so moonquakes recorded each year, total energy release (2×10^13 ergs) is equivalent to about that of 45 g of TNT, some trillionth that of earthquakes. Most usually occur at a fixed phase of the lunar tidal cycle, exhibiting peaks at two-weekly intervals and with a 206-day periodicity thanks to good old solar perturbation. Hear, hear !!! Liked your post too, Hoser. We are almost as far from the moon landing as Kitty Hawk was before the moon landing. Tragic. If only, to sail softly, against the fall of night. brant says: “This work still involves simulations. If you take the data and compare to known phenomena experiments, this is what you come up with: Hollow Moon? I suppose the internet allows this stuff to be examined and rejected by all but the faithful but , really. Mike it’s Sunday evening in Sydney and I’m filling in time, waiting for the 7 pm news. I’m afraid the answer is more mundane. And I suggest that you all may be disapointed or at least have a longer wait. Your government may find more important things to do than sent another rocket to the moon. I’m not talking about CO2. Worry about that will be gone long before 2020. No I’m just talking about money -read available resources, free of other more important commitments. Why did the ancient Egyptians stop building large pyramids? Did they get bored with it or were there more pressing problems to address? Well, well – who would have guessed that…? BTW, can we please clean up all that litter on the moon’s surface – please take it home or put it in the litter-bin. Can someone ask him how deep you have to go on the moon before the temperature is “millions of degrees”? This is all nonsense. Look at the diagram. The inner core has a red Edam rind, surrounded by a yellow Cheddar. Outside that an orange coloured Double Gloucester. Are those orange dots popcorn or Smarties? The morons at NASA would not listen to me! They have no clue the energies and structure changes rotation can create. Don’t forget the moon also slows the planet considering it is moving further and further away. So they used the data from seismographs that had been placed on the moons surface during the Apollo missions. Could it be – I mean is it possible – that the ‘moon landing was faked’ people were plain wrong? Liked your post Hoser. Sadly, in some ways, it appears that we’re in the dark ages, science has become more of a religion than religion, kids who do well in school are outcast, and the greatest leaps to occur relate to social networking, gaming, and weapons. Interesting stuff. I wonder if there is any trace that the Moon’s core once acted like a dynamo to produce a magnetic field. The absence of a rotating iron core on Mars is supposed to be why it lost its atmosphere to space, although ridiculously large volcanoes and evidence of a LOT of liquid surface water argue that Mars was considerably different the husk it is today. Perhaps so was the Moon. Despite the “state-of-the-art” in the headline, this is actually old data analyzed by old methods. Various forms of signal stacking have been used ever since we’ve had ears. The only new part: fast computers make it vastly easier and cheaper. Therefore I’m inclined to trust this study far more than anything using post-1975 data or digital modeling methods. The Apollo programme was at the very edge of technology, infact over the edge. The potential benefits of the programme (mainly political?) were outweighed by the risks of losing astronauts, especially leaving two stranded on the lunar surface, with not even a vague glimer of a chance of rescue, condemned to suffocation. I wonder if anyone has thought to test for oil in the moon ? As a confirmation of abiotic theory. Some Russian scientists might be most inclined in that direction. “This work still involves simulations. If you take the data and compare to known phenomena experiments, this is what you come up with. Engineering strength of materials would suggest that the weight of the lithosphere would crush, stope and fill the void if the material was solid. If plastic, it would flow in to fill the void and probably make for some interesting “basin and range” surface topo. Yes it us another modelling exercise. A few years back a guy did some historical research and became interested in comets. He used the new fangled Newtonian theory of gravitation, constructed a model and calculated the expected return date of the comet. The comet appeared at the calculated time. The guy was of course Halley. Scientists and Engineers have been using models ever since. Wanna build a microcomputer to sell to people to surf the Internet. Use a model to verify the design. Wanna build an aircraft. Use a model. Wanna put a rover on Mars. Use a model. Wanna improve the placement of a heart pacemaker. Use a model. Wanna improve the extraction of oil from a well. Use a model. Wanna improve the efficiency of a car engine. Use a model. Wanna control a disease out break. Use a model. No doubt at the time there were comet skeptics. It would be amusing to see if the arguments used then followed the same patterns used on these blogs. mike sphar – re testing for oil in the moon. Well naturally, because as we all learned from “The Adventures of Rocky and Bullwinkle” there are moonmen . . . .
My first thought on reading this article . . . gee, don’t most objects “in space” have these same similar characteristics? Tom brought up Rocky & Bullwinckle . . . I’m of the age of the Cheech and Chong . . . and when we went to see the movie “Up in Smoke” where they talk about how solar systems are similar to atomic systems . . . never forgot it . . . funny, funny . . . and source it often . . . for more concepts than this one. Our discussion then turned to talking about Einstein and the theory of relativity . . . and for me the formulation of the principle of . . . It’s the little things that can lead to or be the “mean” of the big things. . . I seem to recall from one of the astronomy texts I’ve read over the last 40 years that at a certain size, gravity turns odd-shaped rocks into round ones. At a different size, the force of gravity would increase internal heat to the point where a semi-molten or molten core formed. Most stone planetary balls also contain some radioactive elements, which may also contribute to the molten core of larger moons and planets. Even Enceladus, Ganymede, Io, and Europa may have sufficient heat within their cores to affect surface conditions. I’d be very surprised if Titan did not. This data only seems to confirm what many have postulated over the past 50 or so years.